The mysterious stone figures known as Inushuk can be found throughout the circumpolar world. Inukshuk means “in the likeness of a human” in the Inuit language. They are monuments made of unworked stones that are used by the Inuit for communication and survival. The Inuit make Inukshuk in different forms for a variety of purposes: as navigation or directional aids, to mark a place of respect or memorial for a beloved person, or to indicate migration routes or places where fish can be found. Other similar stone structures were objects of veneration, signifying places of power or the abode of spirits. 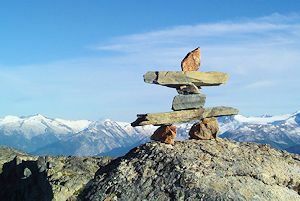 Although most inukshuk appear singly, sometimes they are arranged in sequences spanning great distances or are grouped to mark a specific place.